The breakdown assistance company says motorists paying high taxes on petrol shouldn’t have to tolerate poor road conditions. AA IRELAND HAS launched an online petition calling on local authorities across Ireland to prioritise the repair of potholes on the roads within their jurisdictions. The petition has been set up in response to continual complaints received by the AA about the poor state of roads countrywide, and what the AA called the “seeming inability of local authorities” to have them repaired. “We had a terrible winter, and the freeze did a huge amount of damage.” AA Ireland’s policy director Conor Faughnan said. “Our patrols are attending cars every day that have had damage or punctures as a result. Potholes were particularly problematic for cyclists too, who could face “lethal” consequences if forced to swerve unexpectedly in order to avoid a pothole. The AA said the public were entitled to expect road repairs as a priority given the level of taxes and duties being paid by motorists on their fuel. Faughnan stressed that potholes were degenerative, asserting that failure to address them early would lead to heftier repair bills in the long-term. “If your roof is leaking at home, you don’t put the repair off for a year to save money because you know it will get worse and will cost you more,” he said. The anti-pothole petition can be found on AA Ireland’s website. 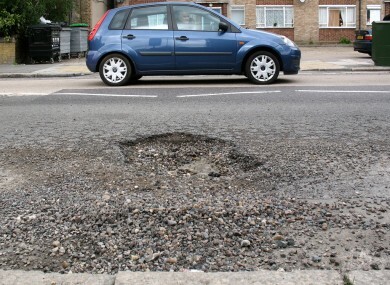 Motorists are also asked to report particularly shabby roads and send in pothole photographs to the AA at publicaffairs@aaireland.ie. Email “AA Ireland launches nationwide anti-pothole petition”. Feedback on “AA Ireland launches nationwide anti-pothole petition”.